This is the second week of the Reading in the Wild book study! 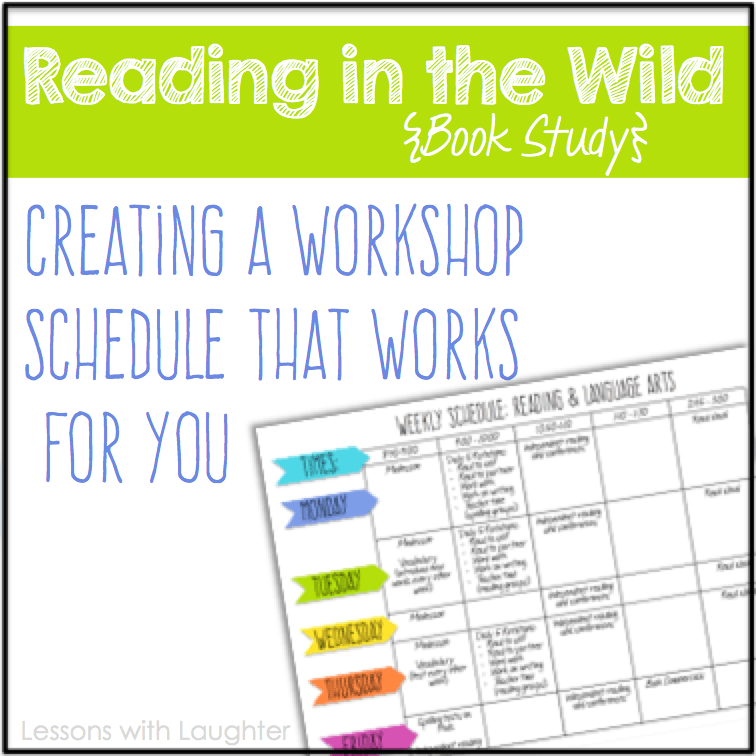 Several amazing bloggers are sharing how they arrange their Reading workshop. 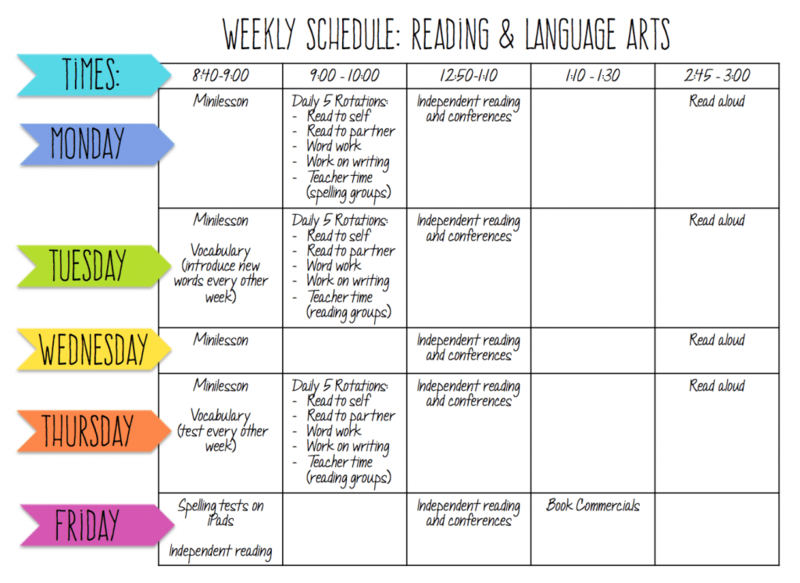 Here is an outline of what my Reading & Language Arts weekly schedule looks like. We have a large block of time in the morning, where we do mini-lessons, vocabulary, grammar, and Daily 5, and then separate time in the afternoon for more independent reading, book commercials, and a read aloud. The blank spaces are where we have other classes or activities scheduled. I wish we could do our Daily 5 all 5 days of the week, it just hasn’t been able to work with our schedule the past few years! My instruction for our mini-lessons is based on the Common Core standards, our vocabulary and grammar curriculum, and my students’ needs. I am thankful that I do not have a basal reader that I have to use. I can choose the texts that I want my students to use and have met with many of my wonderful teacher friends to discuss great quality texts that are a perfect fit for my students and our standards. I absolutely love picture books and usually use them in my mini-lessons. with my small groups for longer amounts of time, we may have Daily 3 or Daily 4, but typically we do all 5 rotations. Also, for the past few years, even though we have 5 rotations, I only have 4 groups. That means that I have one “Teacher Time” rotation without any students, which frees me up to do one-on-one conferencing or spend extra time with one of my small groups. Also, for Spelling I use Words Their Way, so I usually have 4 different spelling groups. On Mondays we do Daily 5 rotations, but with their “spelling groups” instead of their “reading groups” (which we do the rest of the days). When they meet with me in small group on Monday we go over their spelling pattern and words for the week. Another word on Daily 5: Sometimes we are working on longer, more time-consuming projects, and we don’t get to Daily 5, which is completely ok! Sure, my students are constantly begging for it if we miss a day, but they enjoy some of our bigger projects as well that make good use of our reading and language arts time! Like Donalyn and Susan reinforce, I want to give my students opportunities to do lots of reading, writing, and thinking! When my students get back from lunch, they immediately go back to their desks and take out a book for silent reading. They have a book in their desk at all times, and extra books in their book baskets to read, so I don’t let them browse our classroom library at this time. This takes away any temptations for students to avoid reading and spend the entire time looking through books in our library and instead of really reading. And if they say that they don’t have a book or that they just finished a book? I tell them to grab a book from their book basket! And if they don’t have any, then they just get out a textbook to read. This happens maybe once or twice the entire year, and then they know to have backup books ready in case they finish a book during their silent reading time. And they are usually anxious to get started on their next pre-selected book, so I don’t usually have problems with this! finish a book, yet I still managed to get an “A” on my “book report.” After reading about Donalyn Miller’s idea for book commercials, I immediately knew this is what I wanted to use in my classroom. It is a much more authentic practice of sharing books that you enjoy with others, which is much more of a lifelong reader practice than creating a diorama or poster. I tell my students that I want them to have opportunities to share books with their classmates in a similar way to how I share books that I enjoy with my friends! I teach them and we practice doing quick, engaging book commercials to recommend and share books. Sometimes we do this whole class, and sometimes when there are lots of students ready to do book commercials, I tell them to find a group of students with similar reading interests to share their books with! One of the things that I love about our read alouds is that it introduces my students to new genres and authors that they may not have read before. When I finish a book, students are always anxious to read the next in the series, or another book by that author! I know how you feel about Daily 5! I wish it would work everyday, but with our new statewide curriculum, it might not work :/ But I did try 3 days a week & that worked a lot better Thanks for bringing up Book Commercials. I'm looking for ways to introduce new genres to students. I really enjoyed reading this Molly! I loved reading about how you manage your Daily 5 and seeing all the time you use for reading throughout the day. I also like the idea of the book commercials–do you have a separate post on this? I think I remember you mentioning this in the past. Thanks for everything! Wow, Molly! I really, really love this post. There is so much information; I love seeing how you use the Daily 5. Do you have another post about what you use for each of the rotations??? It seems like I need to do some more exploring. Sidenote – BEAUTIFUL schedule! This is just wonderful, Molly!! Thank you so much for sharing and I love reading about how others do literacy in their rooms. You have given me some great ideas for next year! I have both of Donalyn's books on my nightstand to read this month! They were recommended by a colleague! Now that I've read your posts, I am even more excited to delve into them! Please!! Please!! Can you share your reading schedule template? ?